smoker and non-smoker use the same word kin-en? How can I say if I want a non-smoker room? Well observed. This was a mistake on my side, which I immediately corrected. Very usefull and interesting!! Thank you very much! 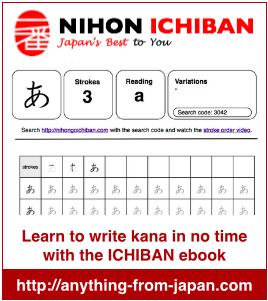 This site is very instrumental for Japanese study! but I found several strange things in the list above, so I’d like to inform. ツ and シ are very alike but absolutely different. Also ン and ソ are apparently same but completely different. We call a brush “burashi”. But I think if you say ブラッシュ instead of ブラシ, it’ll work because there’s no big difference and we know ブラッシュ is a kind of ブラシ. I think these katakana English are one of the most annoying part of studying Japanese for people outside Japan. Thanks for the review and the hints. I immediately fixed it. I fully agree to you that katakana English is one of the most difficult things for foreigners. You have to forget the original pronunciation and adjust it to Japanese pronunciation. This does not come natural to foreigners. Thanks again for you review. This is pretty interesting. Great work. Help me with JLPT N3 preparation. toilet paper toiretto peepa トイレットぺ the pa is missing … or is it just ommited? Thanks for checking. For some reason the katakana after ペ had disappeared. I fixed it and the word is complete now with トイレットペーパー. Thank you very much again for pointing it out. Thank you so much. This was one of the early posts and quality checking was not yet so good (obviously). I corrected the spell mistakes and grammar. Is there a difference between 朝食 (choushoku) and 朝ご飯 (asagohan)? I haven’t learned the first one so I was wondering if it is a synonym or if you only say “朝ご飯” when refering to a breakfast in a familiar environment such as my family’s or friends’ place? There is no major differences between these two words, 朝ご飯 is japanese word while 朝食 is the chinese pronunciation. 朝ご飯 is the more common though !